Lighting is a critical element to the comfort and function level of any kitchen. A good kitchen lighting plan should include the placement of a variety of lighting sources and types. For example, you need lighting to accomplish specific tasks, such as food preparation and cooking. You’ll also want ambient lighting that will help illuminate the entire space and make it an appealing and inviting place to work and socialize in. And you’ll want mood lighting that helps highlight kitchen cabinets, special collections, counter spaces and architectural details. With its sleek, minimalist appearance, recessed lighting can help you accomplish all these tasks and more. Kitchen recessed lighting offers a clean look and can be used throughout the room space. • It’s ideal for counter tops and island bars. • Use it for general lighting in open floor plan areas. • Highlight counter areas, stove tops and other details for visual interest. • Use with or without standard flushmount ceiling lights. Here are some quick tips for creating a kitchen recessed lighting plan. To begin with, draw out a rough map of your kitchen space. If you are adding recessed to an existing kitchen, note where you already have lights, such as ceiling fixtures or range lights. Whatever new recessed lighting you add should work with your existing fixtures. Measure your room to see how many fixtures you will need. A common rule of thumb is that you use one recessed light for every 4 to 6 square feet of ceiling space. Doing so provides even, overall illumination. This is an important rule to keep in mind when you are going to rely exclusively on recessed ceiling lights to illuminate your kitchen. Another common layout is to place lights around the perimeter of the room. Aimed at the countertop edges, the lights will illuminate counter work areas or the sink, and avoid creating shadows by people standing at the counters working. Place your recessed downlights 12″ apart from each other and 12″ to 18″ away from any cabinets to illuminate counter areas. Please note that these are basic kitchen lighting ideas; the exact placement of lights will depend on your unique room space. You’ll also need to decide on the type of recessed housing your lights will need. If there is insulation above the ceiling, you’ll need to choose IC housings. This type of housing can be used in contact with ceiling insulation. If you are doing a brand new kitchen space or new construction, Non-IC housings may be used. Plan on a mix of wide-angle lights for ambient lighting, and focused, narrow-beam lights for lighting over your counters, stove and sink. If your layout calls for recessed lights to be used throughout the kitchen space, you can use wide-angle lights in the center of the room and narrow-beam lights on the perimeter. 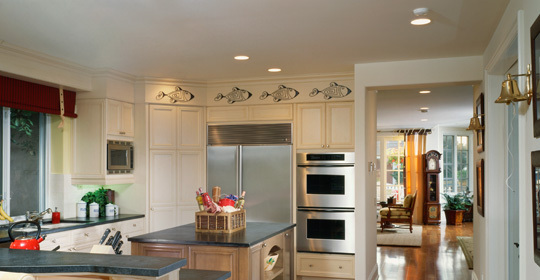 Dimmers help you adjust the atmosphere and mood of the kitchen. They also help save energy and extend the average lifespan of your bulbs. Use separate dimmer switches for different zones of lighting. For example, a separate dimmer for the lights over counter areas, the kitchen island, pantries, or other architectural details will give you a wide range of lighting options. It’s also a great idea to place all the non-recessed lighting on dimmers as well.